A: It isn't a direct retelling of any one story. It is heavily inspired by several different versions of the Ballad of Mulan - including the original poem and many subsequent, ever-evolving retellings within Chinese culture such as the Chinese Opera. The original spark of inspiration came from my frustration with Disney's Mulan and my interest in the subtext of the song 'Reflection'. But the main character of The Hand, the Eye and the Heart is not Mulan. The protagonist of this book is Zhi. It's really important to me that this is clear, because Mulan is such a revered and significant figure and I'm not seeking to mess with her. So I'm not claiming to retell 'the true story of Mulan' here. Zhi's journey definitely echoes Mulan's - but this is about paying homage to a legendary heroine and a heroic archetype, not subverting or revising Mulan's story. A: I was actually lucky enough to have advice and support from several trans and non-binary people throughout the writing of the book. Once it was finished I had two trans sensitivity readers. One is a dear friend (and fellow YA writer) who kindly offered to read the first draft. The other is a very talented young poet who we found through the organisation Inclusive Minds, and he read the nearly-finished version. I tried my absolute best to act on and incorporate every comment or suggestion that both of them made. I also had really valuable help from several readers (and friends and family members of readers) of Chinese and East Asian heritage throughout the writing of the book, and a sensitivity read from another lovely friend who is not only Chinese, but also an English professor at Singapore university. She made quite a difference to the finished product too. I thank the writing gods for all these amazing folks. A: I don't know - but you can bet your sweet bippy I'll post it the millisecond I'm allowed to. A: When it's copy-edited and proof-read my publisher might let me post some extracts, or maybe a free sample will go up on their webste. I will ask, I promise. I'm excited to share it with you. 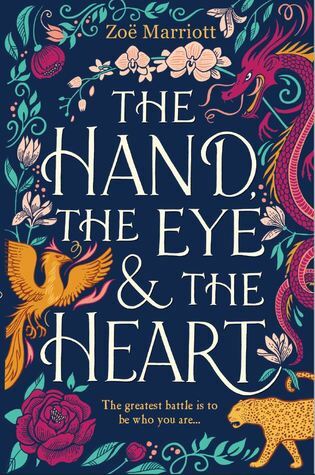 Sign into Goodreads to see if any of your friends have read The Hand, the Eye and the Heart. What is come out in the US? If so will it be an audiobook? I am blind and I do have a hard time reading it in a different way. Ellie wrote: "What is come out in the US? If so will it be an audiobook? I am blind and I do have a hard time reading it in a different way." At the moment this book doesn't have a US publisher, and there aren't any plans for an audiobook. I'm really sorry. If it were up to me both those things would be different. All I can do is right now is cross my fingers that a US publisher or audiobook company may decide to buy the rights to the book and produce something in the future. Eafiu wrote: "I really can't wait to read this one!" Barbara wrote: "Looking forward to this, love all your books"